The location itself is a Skin Care Parlor and Spa since 1978 – a true treasure of Fort Lauderdale! Angelina and her team bring over 60 years of combined experience and perfectly match the “old school” skin care techniques with the latest skin care trends. Working with many skincare suppliers doesn’t only offer the benefit of providing products tailored to clients’ skin needs, it also keeps the team up to date with the latest treatments and products. Most of the products are imported from France and Germany but also local products can be found in the cozy Skin Care Boutique. If you keep buying pharmacy products one after the other, trying to find the right one for you – don’t look any further. Stop by and Angelina and her team will find the right product for your skin. Treating skin and helping clients with their skins’ needs is their passion and they take pride in providing each guest with the best in customer service and technical excellence. Angelina has over 20 years of experience as an esthetician. In 2006, she took ownership of the Spa and created Skin Care by Angelina. She is well-known for combining products creatively to best meet your skin's needs. Personalized treatment plans are very important to her because it creates the best results for your skin. Licensed in Florida since 1994, Angelina also is certified in microdermabrasion and microcurrent facial toning, What makes Skin Care by Angelina different from other Spas is what they bring to their clients. Angelina develops strong relationships with all of her clients who she considers her friends and nurtures their skin care needs. Jennifer is a licensed Esthetician with vast experience. Born in Florida but raised in Germany, where she worked for a skincare ingredient developer. This experience gave her the foundation of understanding the biochemistry of cosmetics. She is a licensed Esthetician in Germany since 2009. 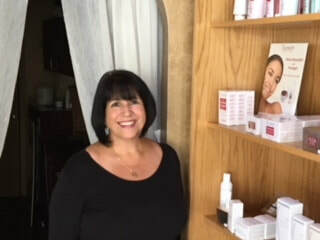 In 2014, she received her license in Florida and joined Skin Care by Angelina, She also teaches advanced cosmetic classes at Palm Beach State College. Our customers appreciate her broad knowledge of skin health and dedication to helping answer all their questions related to their skin care needs. Jennifer brings European skin care wisdom to all of her clients and provides each client with a skin care regimen tailored to their individual needs. Nancy Schaal brings over 40 years experience to the skin care industry with a background in alternative medicine. As one of the early pioneers of microcurrent facial toning in the 1970’s, she worked closely with medical researchers to adapt medical electro-muscle therapy to cosmetic use for estheticians in the beauty industry. In addition to caring for her facial clients, she taught certification classes to licensed professionals throughout the United States and Canada. As a passionate and knowledgeable esthetician, she creates effective customized treatment for all your skin care concerns. Also known as the "Goddess of Brows", Lissette is an eye=brow expert and skin care esthetician. She was born in Havana Cuba and grew up in New Orleans. She is fully bilingual Spanish/English. Her background includes work as a make up artist working with Estée Lauder and Borghese. and a skin care advisor for Cosmix school. Completing the master brow artist course in CA with award winning brow artist Kelley Baker, enables Lissette to bring the latest technology and trends to all of her clients. With over 24 years of experience in facials and waxing, she combines her passion for beauty and the joy of making others look and feel their best. "To all our clients who have been with us for so many years, we thank you for your loyalty and to future clients, we look forward to helping you with all your skin care needs. "